Finger Lakes blueberries are absolutely luscious this year. Fortunately for us in the Finger Lakes Region the blueberry season is long. Picking begins mid—July through the first of September. Whether you are a visitor or local, be sure to get out and experience the pleasures of some fantastic Finger Lakes u-picks. U-picking is a seasonal treat, but also a great hands-on way to appreciate a Finger Lakes farm. 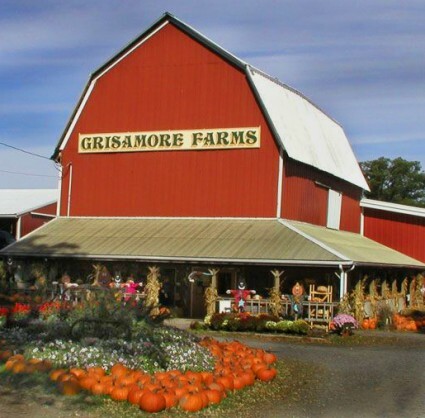 You can pick your own at Giancarelli Farm and Winery in Weedsport, and at Grisamore Farms, in Locke. When I was a youngster I used to pick blueberries in the wild. The bushes were short and the berries were tiny. But we are blessed here in the Finger Lakes with blueberry bushes that are over five feet tall. The blueberries practically jump into your bucket. Freezing blueberries is easy. Just spread them out on a cookie sheet and flash freeze them in your freezer. Then pour them into Ziploc bags. When it’s time to pour them out they won’t all stick together because they were frozen separate from each other. Blueberry muffins, blueberry pancakes, blueberries on your cereal and ice cream—wow, they sure are versatile. They are high in antioxidants and low in calories. You can pick up a bottle of blueberry wine at Giancarelli’s and at Grisamore’s you can browse their store for preserves, popcorn, muffin mixes, kitchen gadgets, even art work! So here are my suggestions for blueberry picking in the Finger Lakes. Dress for the weather, wear a hat, bring plastic bowls or wicker baskets, wear comfortable shoes, and plan to be out in the sunshine picking beautiful sweet gems from bushes that are as tall as you are. We are so lucky in the Finger Lakes to have ample fruit farms surrounding us. Not only are they scenic to drive by but their dwarf trees and bushes are perfect for picking. So what are you waiting for? Get your bowls and get going. Then let me know if you are now a confirmed blueberry picker. Warning--It’s addictive.